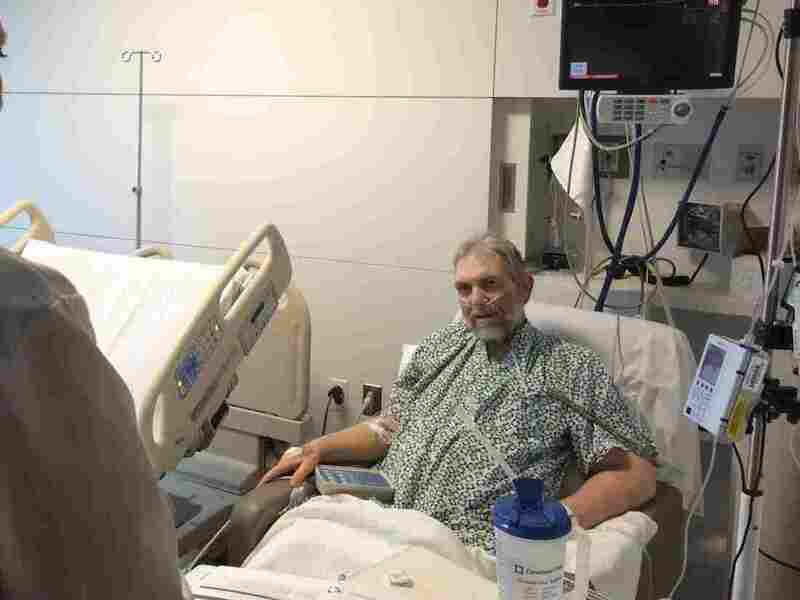 Cleveland Hospitals Grapple With Readmission Fines : Shots - Health News The Cleveland Clinic has seen its Medicare penalties go down, while those paid by hospitals that serve many of Cleveland's poorer residents have gone up. Cleveland Clinic pharmacist Katie Greenlee talks with Morgan Clay about how he should take his prescriptions when he leaves the hospital. At the Cleveland Clinic's sprawling main campus, Morgan Clay is being discharged early one Tuesday afternoon. Clay arrived a couple of weeks earlier suffering from complications related to acute heart failure. He's ready to go home. But before he can leave, clinic pharmacist Katie Greenlee stops by the room. "What questions can I answer for you about the medicines?" Greenlee asks as she presents a folder of information about more than a dozen prescriptions Clay takes. "I don't have too many questions," Clay says. "I've been on most of that stuff for a long time." Clay, 62, has been taking the medicines since he was in his 20s, when he developed heart problems. Still, Greenlee wants to make sure Clay understands the importance of taking his pills at the right time and at their full dosage. Taking medicine incorrectly is a big reason patients return to the hospital, and research has found that as many as 30 percent of prescriptions are never filled. Since it began sending pharmacists into the rooms of patients with heart problems when they are being discharged, the Cleveland Clinic has seen a big drop in the number of patients who need to be readmitted. But it has proved hard for other Cleveland hospitals that serve many of the area's poor patients to achieve the same results. This month, the National Quality Forum began a two-year trial that adjusts Medicare's metrics to account for poorer patient populations. NQF is a not-for-profit advisory group that works with federal regulators on the penalty metrics. NQF's Chief Scientific Officer Dr. Helen Burstin says there's a big question that needs to be answered: "How much should these issues around socioeconomic status (and) poverty be considered as well for the readmission program?" The NQF plans to analyze the readmissions data for signs of poverty affecting the outcomes and figure out how the measurement should be risk-adjusted to account for poverty's influence, Burstin says. "Socioeconomic status may be a proxy for some other really important factors, such as whether somebody has social support at home, whether somebody has the ability to come back and have a follow up appointment with their doctor after hospitalization," Burstin says. The key, she says, is to understand which factors hospitals can be held accountable for and which they can't. "So we would also like to begin to understand what's underlying those differences, and, ultimately begin to understand which of those lend themselves towards improvement strategies, like making sure somebody does in fact have what they need to make sure they don't bounce back into the hospital," says Burstin. Burstin says federal regulators at the Centers for Medicare and Medicaid Services are taking part in the discussions and are "willing to participate in the trial going forward." For now, Cleveland may be the perfect place to help answer this question. On the near west side of Cleveland, Dr. Alfred Connors is chief quality officer at county-owned MetroHealth System. About half of the hospital's patients are uninsured or on Medicaid, which is government coverage for the poor and disabled. "So we take care of people who are homeless, people who don't have places to go when they leave, people who really don't have family supports." Connors says. "They are living by themselves on a very limited income." Unlike the Cleveland Clinic, MetroHealth has seen its Medicare fines increase since the program began. MetroHealth had a 0.83 percent cut in Medicare reimbursement for 2015, as compared with a 0.45 percent in 2013. The clinic's main hospital is more likely to have privately insured patients, like Clay. Since 2013, the clinic's main campus has seen its penalty drop to 0.38 percent of Medicare payments from 0.74 percent. There are several factors at play in the numbers. First, the maximum Medicare penalties increased. A hospital could lose as much as 3 percent cut in Medicare funding starting in the fall of 2014, up from 1 percent when the program started in 2012. In addition, federal regulators began tracking two new conditions. The penalties were originally based on readmissions of Medicare patients who went into the hospital with a heart attack, heart failure or pneumonia and returned within 30 days. Now, federal regulators are also including readmissions for hip and knee replacement surgery and chronic obstructive pulmonary disease. Still, the Cleveland Clinic's Chief Quality Officer Dr. Michael Henderson says socioeconomic issues like poverty are an important factor. "One of the real benefits of some of these programs that have come in place is it's really put coordination of care on the map for patients," Henderson says. Leaders at all three systems say that regardless of the amount of care and coaching a patient gets in the hospital, a patient's home environment is critical. University Hospitals — the city's other big hospital system — also serves a high proportion of the region's low-income patients at its main campuses. It reported a 0.59 percent penalty in Medicare reimbursements for 2015 up from a 0.11 percent hit in 2013. Dr. William Annable, chief quality officer at University Hospitals, is skeptical about the measurement and penalties: "There are some people in the health care industry who see it as the government trying to solve society's problems on the back of the hospitals." This story is part of a reporting partnership with NPR, WCPN and Kaiser Health News.